Rice Lake, WI – Add convenient storage to your backrest in a snap with Hopnel™’s new Backrest Organizer. 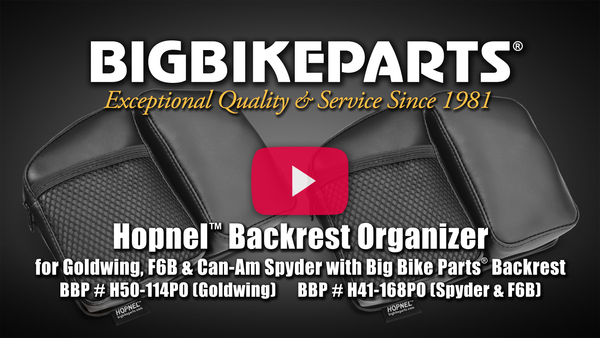 This dual pocket organizer attaches to the existing snaps as found on backrests from Big Bike Parts, Hopnel™ and Show Chrome Accessories for the GL1500 / GL1800 Goldwing and Can-Am Spyder. Overall size is a compact 8 ¾’’ x 6 ½’’ x 2 ½ with three storage compartments. One zippered pouch measuring 6 ½’’ x 3 ½’’ x 2 ¼’’, one larger zippered pouch measuring 6 ½’’ x 5’’ x 2 ¼’’ and a mesh 4 ½’’ x 4 pocket. The H50-114PO is designed for the Goldwing GL1500 and GL1800 models fitting Big Bike Parts backrests 2-377, 52-567, 52-637, 52-771, and 52-797. The H41-168PO is designed with material for the Can-Am Spyder and F6B Goldwing fitting Big Bike Parts backrests 41-158, 41-168 and 52-832. Made in the USA.